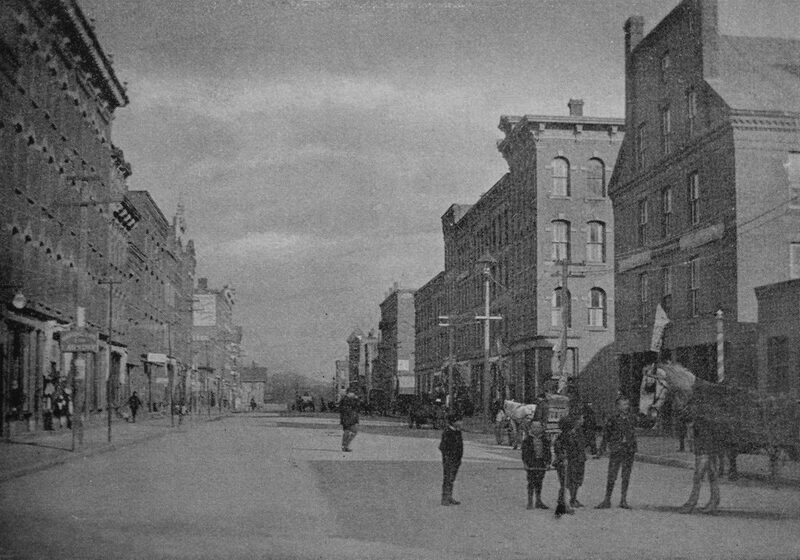 Looking north on High Street from near Oliver Street in Holyoke, around 1892. Image from Picturesque Hampden (1892). 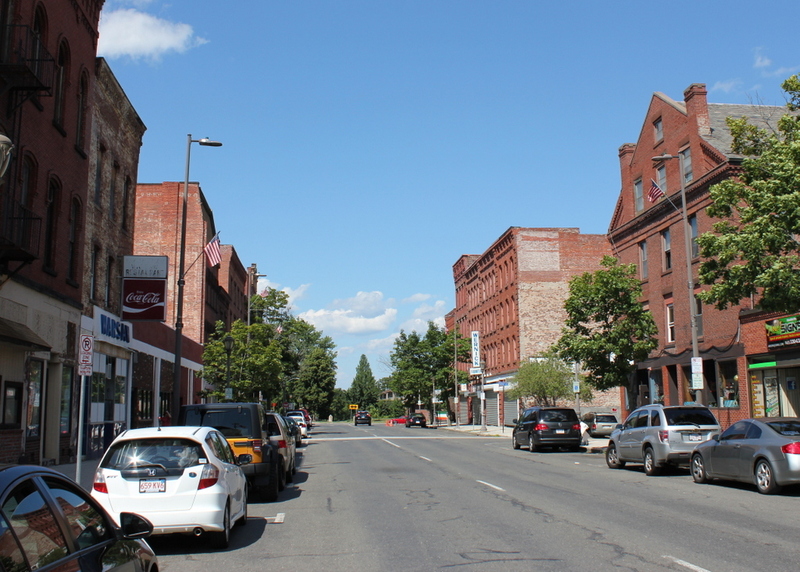 As mentioned in the previous post, this section of High Street was developed in the second half of the 19th century as one of the primary commercial centers in Holyoke. Most of the buildings in this scene date to around the 1860s and 1870s, but perhaps the oldest is the Fuller Building, visible on the far right of the scene at the corner of Oliver Street. It was built sometime before 1863, probably around the early 1850s, and is a rare example of Greek Revival architecture in a city that is largely dominated by Italianate-style commercial blocks. Just beyond the Fuller Building, on the other side of Oliver Street, is the four-story Hutchins House, which was built in 1878. Around the time that the first photo was taken, it was being used as a boarding house, with several stores on the ground floor, including a dress and cloak maker as well as a dry goods store. Just beyond this building is a row of five matching Italianate-style blocks, all of which were built sometime around 1870. The Hutchins House has since been demolished, and the site is now a small parking lot, but the other five buildings are all still standing with few exterior changes since the first photo was taken. Likewise, the buildings on the left side of the photo also date back to around the 1860s and 1870s, and most of the ones in the foreground still survive, although the one on the far left of the first photo appears to have either been demolished or trimmed down to one story. Otherwise, the only significant change in this scene is further in the distance, beyond Lyman Street. Originally, High Street continued north for two more blocks beyond Lyman Street, ending at the present-day Pulaski Park, but these buildings were demolished in the 1970s as part of an urban renewal project, and today the Echo Hill Townhouses are located on the site.